Forty-one-year-old Mustefa Hafiz resides in the lowlands at the bottom of a hill in the village of Medeoda, in eastern Ethiopia. But lately he feels like he’s on top of the world. “Thirteen years ago, we did not have the capacity to make our land productive,” Mustefa says. Then, Mustefa’s family, like 79 percent of farmers in his community, relied on wheat provided by the government for 3 months out of the year. Because Mustefa’s farm was on the bottom of the hill, his crops were often ruined by cyclical flooding that accompanied the rainy season. “I did not have the skills needed to rehabilitate my farm and I could not grow enough food to feed my family,” he says. His family’s fortunes started to improve dramatically in 2005 when CRS piloted the first Integrated Watershed Management project. As part of CRS’ commitment to strengthen farmers’ livelihoods so they can build stable futures, CRS targeted 1,323 community members to help them rehabilitate 500 acres of land that was previously bare, eroded and unfit for farming. 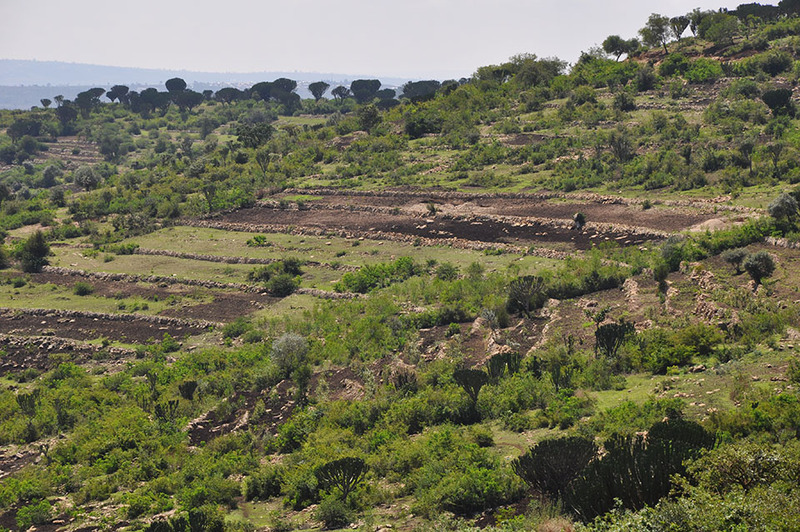 With techniques to conserve the farmland’s soil and to prevent flooding, households like Mustefa’s have enhanced their land use and crop cultivation. The project also taught community members to adopt various water supply and sanitation techniques, like building restroom facilities to improve health. Along with irrigation practices, CRS established four agro-enterprises of 15 members each. They received a borehole, irrigation pump, and a reservoir. With these assets, they were able to increase land productivity and crop yields. Prior to the project, Mustefa had been unable to manage the recurrent flooding that always devastated his crops. “Before, I only had one ox and barely grew enough to sustain my family." Since he applied what he learned from CRSadv intervention, he dramatically increased his crop production to 15,432 pounds per year. Mustefa invested profits from his cash crops in more land, cattle, and fertilizer which made his land more productive and enabled him to transition to high-yield vegetables. By 2009, his cash crop increased to 28,770 pounds per year. He again invested profits, this time in real estate in the nearby town. Within a decade, he built 18 houses that bring in monthly rent payments. He also invested in his family—he changed his house from a traditional grass hut to a house made with corrugated iron sheet and cement and equipped with a water pump and modern outhouse. I can’t imagine what my life would have been without CRS’ intervention. I may have died without it. To free his wife and five daughters from housework, he hired domestic help. Mustefa glories over the fact that his daughters and son are enrolled in school and his eldest daughter is preparing to go to university. “My children will become doctors,” Mustefa says as he marvels over the life he has been able to create for himself and his family. 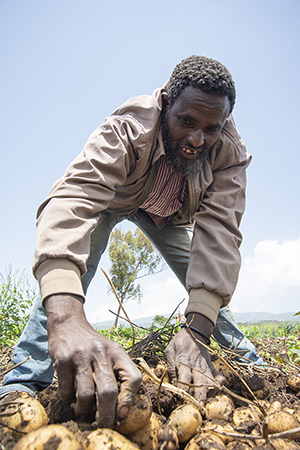 Increased farm productivity, coupled with diversified income, built resilience that helped Mustefa during the 2015-2017 El-Nino shocks that hit Ethiopia particularly hard. Since 2005, Mustefa’s annual profits have increased from $0 to $9,400—the average annual profits for small holder farmers in the community is $721. Mustefa is also a community leader. Using the skills gained from CRS, he mobilized community members to build modern outhouses. He received an award from the Ministry of Health for his public service. “I can’t believe that back then, my only goal was to just be able to feed my family,” he muses. To further assist farmers successfully engage in markets, CRS advised them to establish a cooperative, and the agency provided a storage unit. It allows farmers to safely hold crops until market prices rise, further improving their profits. “I can’t imagine what my life would have been without CRS’ intervention. I may have died without it. I certainly would not have been able to raise my children,” Mustefa says. Medeoda in 2005. 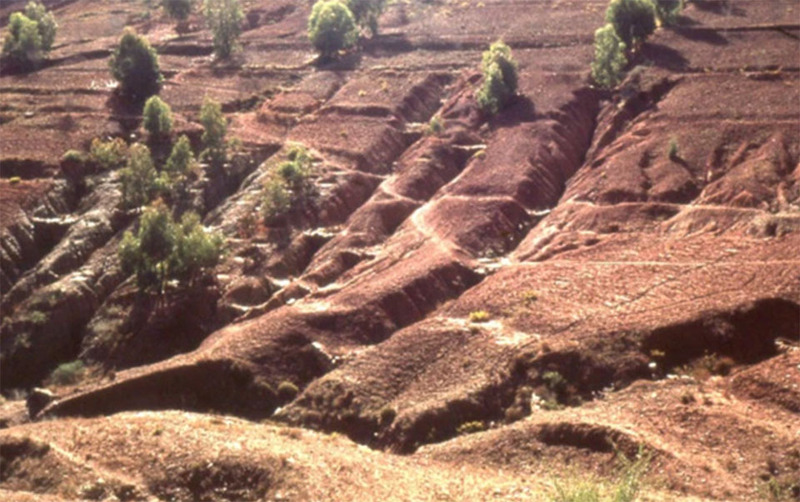 Before CRS’ integrated watershed intervention, Mustefa’s hometown was eroded and bare from the cyclical flooding. Families relied on food aid because their farmland was unproductive. Medeoda in 2018. After CRS’ integrated watershed intervention, farmland in Medeoda was revived. And 13 years later, farmers went from being food aid recipients to successful agro-entrepreneurs. Now CRS is advising farmers to establish a cooperative and has created a storage unit for safe crop storage.